Inventory #: K1014 -WRANGLER Men's XL Light Blue Denim Pearl Snap Long Sleeve Western Shirt Size: XL Measurement in US inches. •	Chest: 24.5" (armpit to armpit) •	Length: 31" (bottom of collar to back hem) •	Sleeve: 25" (shoulder seam to end of cuff) The best way to gauge whether an item will fit, is to measure a similar garment you already own and fits you well, and compare it to the measurements given above. Size: X-Large - Roomier Fit. • Wrangler Denim Button Front. Pit to Pit: 27.5". Long Sleeve Western Shirt. Button Down Collar. Overall Length (Bottom of Collar to Bottom of Back) : 33". Designer: Wrangler. Color: Red with stripes. Condition: Preowned. Slightly faded, could use an ironing.There is also a small mark on the bottom front of the shirt. Wouldn’t bee seen if tucked in. Material: 100% Cotton. Great condition no tears marks and stains. has a nice front logo on the pocket. NEW, NEVER WORN. CARDBOARD COLLAR SUPPORT STILL IN PLACE. EXCELLENT CONDITION! OPPORTUNITY TO MAKE YOU 100% SATISFIED WITH YOUR NEWLY ACQUIRED TREASURE. Wrangler Factory Sponsored Bull Riding Logo Rodeo Western Cowboy Shirt. It is machine washable. 26" sleeve length from shoulder to cuff. 27" underarm to underarm. Has 2 pockets in front with button for closure. Color: Black. 30" length from shoulder to seam. Style# HLBIWYA. EUC Wrangler Gray Green Casual Button Front Fishing Shirt 100% Cotton XL FS! Size: XL. Short Sleeve. Color Mud Green. Notes: Good Condition. This shirt is very quality made, just as you would expect from Wrangler. This shirt is in good condition as shown in photos. Happy buying! Sleeve: Short Sleeve. Shoulder: 20. Sleeve: 11. Color: Black. Size: Adult Extra Large (XL). Good used condition. Up for sale is a used - Wrangler - Pearl Snap Button Up Shirt. Size: Adult Extra Large (XL). Very good used condition. 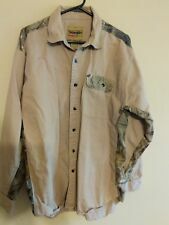 Up for sale is aNEW - Wrangler - Pearl Snap Shirt. Size: Adult Extra Large (XL). Up for sale is a used - Wrangler - Pearl Snap Button Up Long Sleeve Shirt. Size: Adult Extra Large (XL). Very good used condition. Care: Machine wash. Chest: 27" from underarm to underarm. Length: 30" from base of collar to hem. Material: 100% Cotton. Sleeve: 11" from shoulder seam to cuff. Up for sale is a used - Wrangler - Pearl Snap Button Shirt. Size: Adult Extra Large (XL). Very good used condition. Pink Cowboy Cut. Button-Down Collar. Button Up Shirt. 21" Across Shoulders. 100% Cotton. 30"/32.5" Length. Excellent Pre Owned Condition. No Stains No Snags No Holes. It has been washed and dried. Up for sale is a used - Wrangler - Pearl Snap Shirt. Size: Adult Extra Large (XL). Very good used condition. Great overall condition. No major signs of wear. Second button down is missing but extra buttons are available just needs to be sewn on. Up for sale is a used - Wrangler - Pearl Snap Shirt. Has a small hole on the front side. Size: Adult Extra Large (XL). All colors bright & vibrant. Good used condition. Up for sale is a used - Wrangler - Pearl Snap Shirt. Size: Adult Extra Large (XL). Very bright & vibrant colors. Very good used condition. 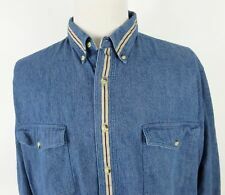 Charcoal Gray Denim "look" Wrangler Button Up Shirt XL. 26" shoulder seam to end of cuff 22" across chest. 19" shoulder seam to seam. back of collar to bottom back 34". Size: XL. Color Blue Brown.